Well… at least they helped to its creation a lot. Let me explain. The cargo that Yali refers to is technology—tools as simple as axes; accessories such as umbrellas; and more complicated inventions such as cars, computers, cell phones, and the Internet. After all, Diamond points out, a mere two centuries prior to his meeting Yali, New Guineans were still using stone tools. What factors caused this gap between the development of one culture and another? Diamond searches for the answer for years, and his answer to Yali’s question is that book, “Guns, Germs, and Steel”. He explains in the book why Eurasian civilizations (including North Africa) have survived and conquered others, while arguing against the idea that Eurasian hegemony is due to any form of Eurasian intellectual, moral, or inherent genetic superiority. Diamond argues that the gaps in power and technology between human societies originate in environmental differences, which are amplified by various positive feedback loops. Wheat is important. It was (and still is) one the main food source for most of the human population. Globally, wheat is the leading source of vegetable protein in human food, having a higher protein content than other major cereals, maize (corn) or rice. 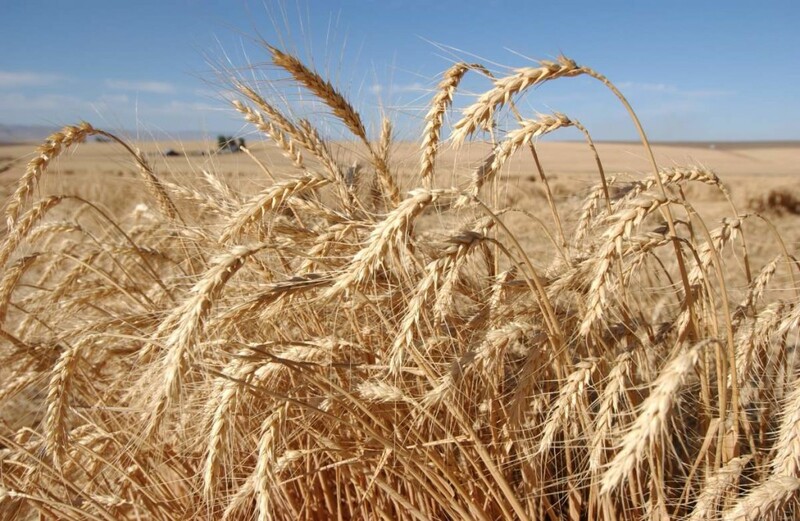 Cultivation of wheat began to spread beyond the Fertile Crescent after about 8000 BCE. Jared Diamond traces the spread of cultivated emmer wheat starting in the Fertile Crescent sometime before 8800 BCE. Archaeological analysis of wild emmer indicates that it was first cultivated in the southern Levant with finds dating back as far as 9600 BCE. Genetic analysis of wild einkorn wheat suggests that it was first grown in the Karacadag Mountains in southeastern Turkey. Dated archeological remains of einkorn wheat in settlement sites near this region, including those at Abu Hureyra in Syria, suggest the domestication of einkorn near the Karacadag Mountain Range. With the anomalous exception of two grains from Iraq ed-Dubb, the earliest carbon-14 date for einkorn wheat remains at Abu Hureyra is 7800 to 7500 years BCE. Remains of harvested emmer from several sites near the Karacadag Range have been dated to between 8600 (at Cayonu) and 8400 BCE (Abu Hureyra), that is, in the Neolithic period. With the exception of Iraq ed-Dubb, the earliest carbon-14 dated remains of domesticated emmer wheat were found in the earliest levels of Tell Aswad, in the Damascus basin, near Mount Hermon in Syria. These remains were dated by Willem van Zeist and his assistant Johanna Bakker-Heeres to 8800 BCE. They also concluded that the settlers of Tell Aswad did not develop this form of emmer themselves, but brought the domesticated grains with them from an as yet unidentified location elsewhere. The cultivation of emmer reached Greece, Cyprus and India by 6500 BCE, Egypt shortly after 6000 BCE, and Germany and Spain by 5000 BCE. “The early Egyptians were developers of bread and the use of the oven and developed baking into one of the first large-scale food production industries.” By 3000 BCE, wheat had reached England and Scandinavia. A millennium later it reached China. The first identifiable bread wheat (Triticum aestivum) with sufficient gluten for yeasted breads has been identified using DNA analysis in samples from a granary dating to approximately 1350 BCE at Assiros in Greek Macedonia. Wheat continued to spread throughout Europe. In England, wheat straw (thatch) was used for roofing in the Bronze Age, and was in common use until the late 19th century. Imagine that you’re living in the ancient Egypt. Wheat would be so important that without it, you would probably starve to death. And there would be lot of “enemies” around: mouses, insects, weevils, borers, birds… they can cause major losses during storage. Thousands of people could starve because of the damage caused by the vermin. And now imagine an animal hunting birds, mice, rats, scorpions, cockroaches, grasshoppers, and other small animals in the vicinity, without consuming, or even without polluting the wheat. Yes, it is cats! 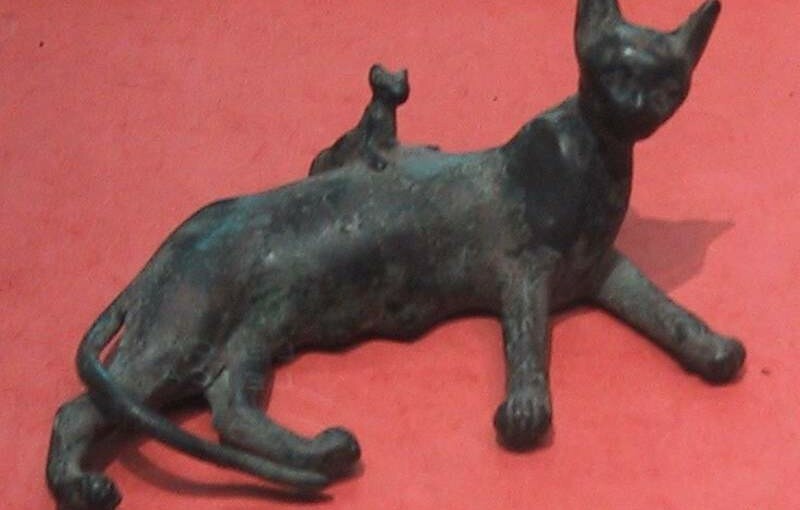 A bronze statue of the cat goddess Bastet (Louvre Museum). The earliest evidence of felines (specifically, lions) as deities comes from a c. 3100 BC crystal cup decorated with an image of the lion-headed goddess Mafdet. The goddess Bastet was originally depicted as a fiercely protective and warlike lioness, like Sekhmet, but as Bastet’s image “softened” over time, she became more strongly associated with domestic cats. As cats were sacred to Bast, the practice of mummification was extended to them, and the respect that cats received after death mirrored the respect with which they were treated in everyday life. The Greek historian Herodotus wrote that in the event of a fire, men would guard the fire to make certain that no cats ran into the flame. Herodotus also wrote that when a cat died, the household would go into mourning as if for a human relative, and would often shave their eyebrows to signify their loss. Such was the strength of feeling towards cats that killing one, even accidentally, incurred the death penalty. Another Greek historian, Diodorus Siculus, describes an interesting example of swift justice imposed upon the killer of a cat: about 60 BC, he witnessed a Roman accidentally kill an Egyptian cat. An outraged mob gathered and, despite pleas from pharaoh Ptolemy XII, killed the Roman. The goddess Mafdet, the deification of justice and execution, was a lion-headed goddess. The cat goddess Bast (also known as Bastet) eventually replaced Mafdet, and Bast’s image softened over time and she became the deity representing protection, fertility, and motherhood. As a revered animal and one important to Egyptian society and religion, some cats received the same mummification after death as humans. In 1888, an Egyptian farmer uncovered a large tomb with mummified cats and kittens. This discovery outside the town of Beni Hasan had eighty thousand cat mummies, dated after 1000 BC. Cats were one of the most recognizable species in Egyptian culture and were domesticated much later than dogs. Two types of smaller cats appeared in ancient Egypt: the jungle cat (Felis chaus) and the African wild cat (Felis silvestris libyca). The African wild cat was domesticated from the Predynastic Period onward. Wild cats naturally preyed upon the rats and other vermin that ate from the royal granaries. They earned their place in towns and cities by killing mice, venomous snakes, and other pests. They were worshiped by the Egyptians and given jewelry in hieroglyphics. Without the domestication of the cat, I think our civilization wouldn’t improve that much, simply because of the food loss.